As every resin model, much care is needed when removing and cleaning the pieces, particularly the smallest ones, because the risk of damage is very high. As every other GBModelli kit I had the opportunity to review, casting is of the highest quality although in this case flash is somehow more pronounced than in other kits, but it can be peeled away very easily. Every piece falls in the right place without too much fuss. Wheels are small, the steel part of each one is very thin, while the outer tyre is thicker and it is connected to a think piece of the casting branch: this means that the steel part is the weak spot of the system and it can break when detached, leaving part of the tyre on the branch. Careful use of tweezers or nail cutter is recommended. When mounting tracks, some teeth must be removed, particularly when the tracks touch the return rollers, which are not deep enough. Remember to drill the holes on the anterior mudguards (see the preview) and to scratch the anterior hooks. Few topics are so debated by Italian experts such as the camo of those M11/39s serving in North Africa, mainly because they show a camo which was never seen in any other vehicle before and afterwards: in b&w pics, patches of darker color in geometric shapes on a lighter background. Until 10 years ago, it was interpreted as a combination of sand/medium green. 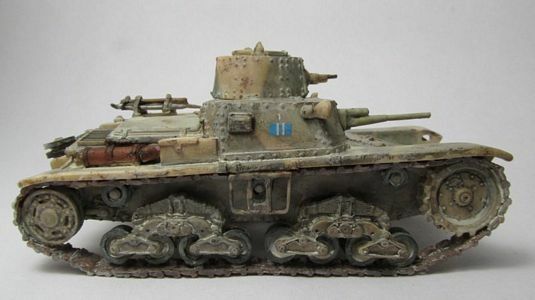 Recently, some video footage, newer pics and a British report on captured M11/39s pointed out that the colors were three, the third one being so faded and close to sand on b&w pics to be almost indistinguishable. To sum things up, it appears probable that the third color was some sort of gray and that the Italians tried to copy the British caunter scheme. People interested in this topic, and able to understand Italian, can read everything here. I painted the model sand, with light green and grey patches, to reproduce the faded paint effect you can see in b&w pics. These vehicles had either a white cross (earlier) or a vertical Italian flag on the turret back, so I hand painted the last one. Also, they had a posterior license plate with numbers starting with 27, plus tactical markings which I took from an Italeri M13/40 kit.